Stainless Steel Heavy Duty Drawn with Embossed Graduations and Stainless Steel Standard Duty Flo-Spun with Raised Graduations. Sampling Dippers that all fit through std. 2" drum bung holes. Handles are 28" long. Handles can be extended. 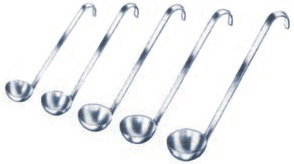 Stainless Steel Ladles with multiple capacities, bowl diameters and handle sizes. One-piece casting w/capacity stamped on handle. Strap handled cover and ridged bottom. Stainless Steel Storage Containers with multiple capacity, diamter and depth sizes to choose from. Storage containers also available without handles and with stainless steel bottoms only upon request. Stainless Steel Storage Containers without handles with multiple capacity, diamter and depth sizes to choose from. 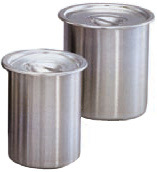 Stainless Steel Covers for multiple sized Stainless Steel Storage Containers. 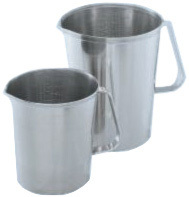 Stainless Steel Griffin Style Beakers with multiple capacity, diameter and height sizes.